Chester Creek’s™ Tiny Mouse™ is about half the size of a standard computer mouse and just right for children as well as seniors or those with arthritic or stiff hands. 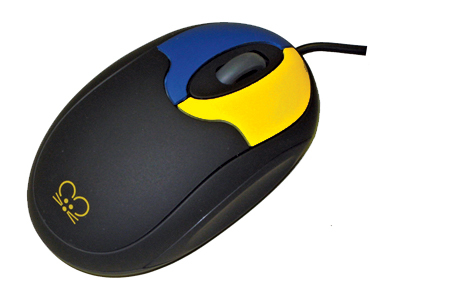 The small size and a smooth-rolling scroll wheel help users who find it painful to extend and stretch their hands to click the buttons on a standard mouse. The colored dots on the buttons help out children who haven’t quite mastered their lefts or their rights, making child’s play out of pointing and clicking. With a simple blue-click or red-click, children will learn with greater comfort and control without becoming easily discouraged. This tiny mouse will enhance any senior's or child's computer system. And with optical tracking, there is no longer a trackball to become dirty, lost or malfunction.
" Am so thrilled with my Tiny Mouse! It not only helps with my weak fingers from arthritis but the scrolling knob helps take strain off my carpel tunnel sensitive wrists. Not having to reach so far with my hand as a regular size mouse is great and I can spend more time using the computer. Thanks and you can use this on your website.